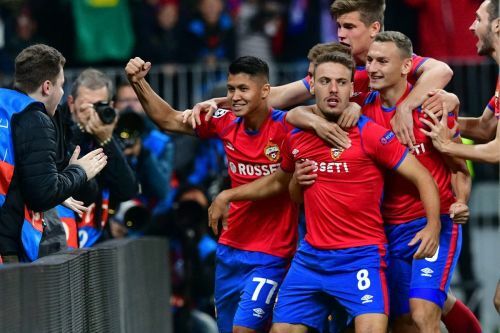 Three-time defending champions Real Madrid were left stunned by Russia's CSKA Moscow, who defeated them 0-1 at the Luzhniki Stadium in Moscow on Tuesday. It was CSKA’s most famous victory in the history of the European competition. Nikola Vlasic put the home side ahead in the second minute, which was enough to bring home all the three points. Real hit the woodwork three times, but failed to find the back of the net in the remaining 88 minutes thanks to a superb defensive display from the Russian champions. The game produced a dramatic end as goalkeeper Igor Akenfeev was shown a red card for showing dissent to the referee. The only goal of the match was scored by 20-year-old Croatian Nikola Vlasic, who was is loan from Everton. Toni Kroos tried to pass back, but it was intercepted by Vlasic who made a mockery of Real defender Raphael Varane and calmly put the ball into the back of the net. This was Real’s second defeat in the last three games. They were routed by Sevilla in La Liga, before a goalless draw with neighbours Atletico Madrid. Moreover, they failed to score a goal in all these three games. Since the departure of Cristiano Ronaldo, Real Madrid didn’t bring in a replacement who could score just as the Portuguese did in the last nine years. President Florentino Perez tried to bring Eden Hazard from Chelsea while there were also rumours regarding Neymar. In the end, it was Mariano Diaz who made a comeback to Santiago Bernabeu after his one year stint with French club Olympique Lyon. In the absence of Gareth Bale and attacking playmaker Isco, Mariano should’ve started along with Karim Benzema. But Lopetegui had other plans as he decided to start with Marco Asensio and Lucas Vazquez to produce more attack from the flanks. Asensio lacked lacking pace and possession and lost the ball too many times. On the other flank, Vazquez was creating one or two odd moves, but failed to finish it off in front of a resolute defence. During his time in Real, Ronaldo single-handedly rescued his team in this type of matches, either with his clinical finish or with a sumptuous free-kick. But this Real team lacks a finisher who can save the team when they are having a bad day. Mariano or Vinicius has the ability, but have not been given enough match time by their coach.